After the season opener at the 50th Amalie Motor Oil Gatornationals in Gainesville, Florida; the NHRA Technical Services mandated a new rule that will be in effect for the Denson Spark Plugs NHRA Four-Wide Nationals. 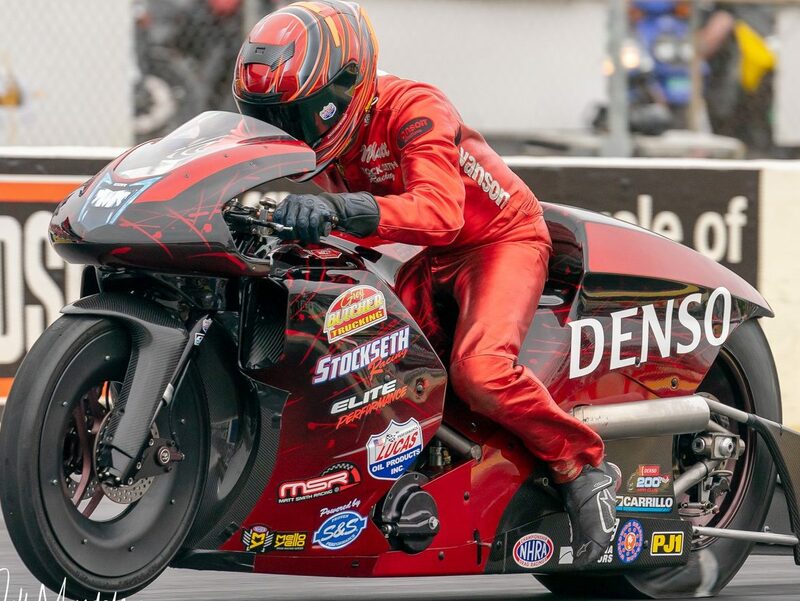 The NHRA Technical Department is increasing the minimum weight of the Harley-Davidson, Victory, Erik Buell Racing and Buell motorcycles from 625 pounds to 640 pounds. All other motorcycle minimum weights will remain the same: (Suzuki: 2-Valve, 107 cubic inch displacement (cid) – 590 pounds), (Suzuki: 2-Valve, 113 cid – 600 pounds), (Kawasaki: up to 107 cid, 2 or 4-valve – 575 pounds). Is this rule change a knee jerk reaction to the performance of a few of the teams in the class? The NHRA stands behind its claim to create parity within the Pro Stock Motorcycle class but they continue to punish those teams that are working feverishly to improve. Meanwhile, those who are complaining aren’t putting in the work necessary to successfully compete. What happens when the teams who have been hit with this weight penalty work to overcome the added weight through research and development along with testing? It’s not the job of the NHRA to levy sanctions that penalizes the success of testing and innovation. Racing is more than just putting a fast engine in anything and expecting to run fast, especially in the pros. It requires the complete package of up-to-date chassis and other essential equipment. In business, anyone resting on yesterday’s merits will soon be left behind. Many will argue that they don’t have the financial backing or simply aren’t willing to have their own race engine program. But if teams are going to put their performance in the hands of someone else and then not get the desired results, they must find another performance manufacturer that will get them the preferred outcome. This requires due diligence and a commitment to excellence. That the other manufacturers haven’t put the same amount of time and money into their programs to improve chassis, bodies and other equipment is not the fault of the Harley-Davidson, Victory and EBR teams. If the “Suzuki guys” aren’t going to take the much-needed time to do the research and development needed to keep up, then they should scale back their expectations. Article by veteran journalist Dujunnea Bland contributing. Cycledrag.com is thrilled to have the talented writer contributing. Click here to learn more about Bland.